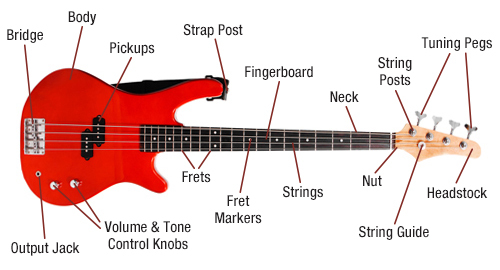 The bass guitar is a stringed instrument played mostly with your fingers or thumb by plucking, slapping, popping, tapping or picking with a plectrum. The bass guitar is most commonly a 4 stringed instrument. The strings are tuned to E, A, D and G.
Most people stand to play the bass guitar, but it is common for beginners to sit when playing. The bass is easy to set up. Take it carefully out of its case and make sure you secure your neck strap carefully. The strap should be loosened or tightened so that it is comfortable and supportive. Always have some spare strings handy in case a string breaks. Your tutor should be able to re-string your bass for you in a lesson, or you can always take it to a music store for restringing. Always place your bass in the case string side up and never leave it standing unattended against a chair or on the floor. Since the 1960s the electric bass guitar has filled the role of the acoustic double bass in many music settings. The function of the bass guitar is to lead the rhythm section and to anchor the beat. The bass guitar is versatile and can play many different types of music from jazz and blues, to country and rock. From metal to reggae, and even gospel. Its sound is deep and intense.